With a single-head punching machine, the entire punch moves the head up and down. This technology creates clearance for 90-deg. bends to 3 in. high, key to progressive bending. Securing the savings of individuals and industries just doesn’t happen automatically; or does it? For Fort Myers, FL-based Vault Structures, Inc. (VSI), the answer is it does. Founded in 1987, the company produces custom high-security blast panels, U.L.-listed modular vault panels, vault doors and safes, as well as lockers and safe deposit boxes for the banking, jewelry and pharmaceuticals industries. Business is so good that last year, with its safe-deposit-box output rivaling the industry’s biggest names, VSI recognized that in order to keep pace with increasing demand by commercial and financial institutions, it had to increase its automation efforts at its 40,000-sq.-ft. facility beyond the three older turret punches and press brakes, which are still in use. 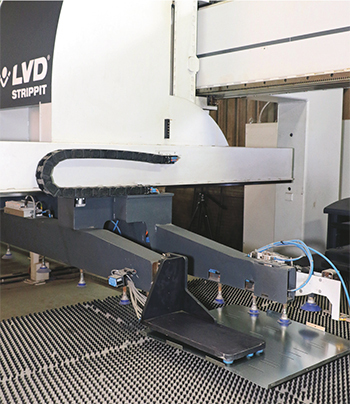 As a result, CEO Kevin McNamara and design engineer Sara Cheney attended FABTECH 2017 in Chicago, where they evaluated systems by Akron, NY-based LVD Strippit, ultimately selecting a Model PX 1530, a 20-metric-ton single-head punch press that can punch, form, tap and progressively bend a 90-deg. angle to 10 ft. long. Paired with a stand-alone FA-P single-sided load/unload system to eliminate manual sheet handling, it can operate unattended until its metal supply runs out. 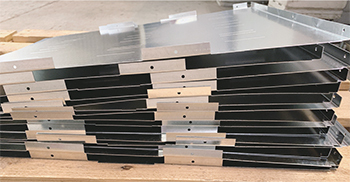 Since installation in early 2018, VSI has dedicated the system to producing sheetmetal parts for its American-series safe deposit box, made of 22-gauge galvanized steel. Overall, Cheney estimates that moving to an automated system cut production time by 60 percent or more, as VSI now can produce 1800 shelves in 12 hr. Parts remain tabbed together until ready for removal. The punch separates them, followed by automatic removal via pneumatic grippers. VSI’s more complicated sidewall parts measure 15 by 20 in., have three offset bends in the middle with two slots in each bend, a 90-deg. bend along the short edge with six countersunk holes, and three 90-deg. bends (all short tabs) with one countersunk hole each on the long edge. Previously, operators would manually load a single blank on the press, punch the part, slots and holes, and keep the parts tabbed together. Once the sheet came off the punch, the operator would shake the parts out of the skeleton, stack them on a pallet and manually fold the skeleton. 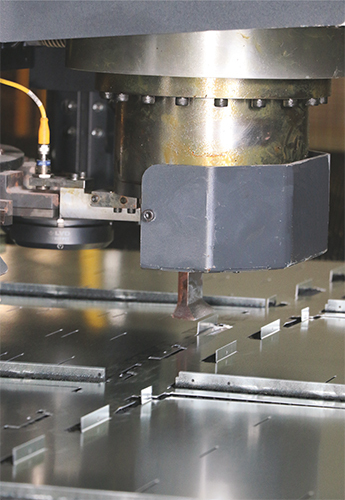 A fork truck would move the pallet to a press brake where an operator would bend the three offsets, make the 90-deg. bend on the short edge, and rotate the sheet to bend the tabs on the long side. The operator would then stack finished parts on the pallet and move them to the assembly area. Now, a forklift driver places a stock of raw sheets on the automated system’s loading table, typically 200 to 300 sheets depending on size and thickness. The loading table then slides into position underneath the gantry. To eliminate double loading, a blast of compressed air hits a corner of the sheet while two of the loader’s 12 pneumatic grippers grab the corner and shake it. The gantry then loads the blank from the left side of the punch table, where three programmable and relocatable clamps grip it. After punching, countersinking holes and bending (more details shortly), the loader’s pneumatic grippers lift a completed wall off of the table and place it on a pallet, stacking walls consistently. After removing all walls, the press grippers pull the skeleton to the right and push it through a drop chute. This gantry runs unattended, loading blanks and unloading finished parts from the right side of the system. Progressive bending employs a 3.622-in. tool to create a bend of about 30 deg. After the first bend, the table moves the sheet 3.622 in. and the tool then makes another 30-deg. bend, and so on. A 90-deg. bend takes three passes. Cheney and Mendez work as a team to maximize sheet utilization. Finished shelves for safe deposit boxes stack up, waiting to be moved to the assembly area. 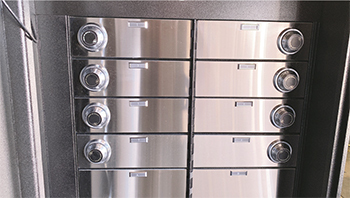 A completed VSI American-series safe deposit box. Cheney adds that leaving large parts tabbed together may result in sharp points that require deburring. To eliminate this hazard, the press punches out the tabs as the final step before removal of a finished shelf. 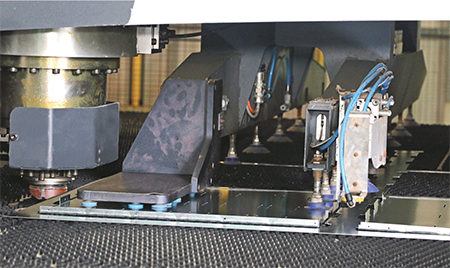 Due to high customer demand, VSI has only had the time to program its automated system for a limited number of parts. When the company enters its slow season in winter, it will develop designs and programs for other parts, such as vault-door parts made from 12-gauge steel. This part must be punched out and have holes made and tapped, which currently requires moving the part to the machine shop. Article supplied by LVD Strippit, Akron, NY; 716/542-4511/ 800/828-1527, www.lvdgroup.com.